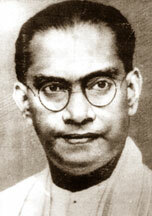 Warnakulasuriya Santiago Fernando of Negombo, followed Phillip Gunawardena at the LSSP conference in May 14, 1950 and joined the breakaway group. He helped Philip to organise the VLSSO and also formed a strong VLSSP group in Negombo. He met the LSSP activists like Edwin Fernando, Michael Appuhamy and Anslem de Saram of Negombo and Henry Karunaratne of Heenatiyana and convinced them to join VLSSP. Besides Catholic youths in Negombo like K. Julian Perera, Eugene Fonseka, Eddie Cooray and Shelton Miral followed Santiago Fernando and joined the VLSSP. Edwin Fernando was able to get many youths in Periyamulla to join the VLSSP Youth League. About 30 youths from Negombo attended the VLSSP annual youth conference held in October 1950 at the Town Hall, Colombo.The CP-VLSSP United Front formed in April 1951, helped to make both the VLSSP and the Communist Party stronger in Negombo area. By this time the CP under Cevil de Silva had forged ahead in Kurana-Katunayake area. The VLSSP too led by Santiago Fernando was gaining ground in Negombo. The Communist Party had a strong Toddy Tappers’ Union in Negombo and that had its head office in Periyamulla.This became the centre of CP-VLSSP United Front in Negombo and all its meetings and rallies were held there. At the election of the Andiambalama Village Committee within Negombo electorate held in May 1951, the CP-VLSSP United Front could command power. de Silva of the CP won Kurana-Katunayaka, Henry Karunaratne and P. Wimalasena of the VLSSP won Heenatiyana and Madawala wards. Out of the 13 seats in the VC, the candidates of the progressive camp won 07 seats and pro UNP rule for 18 years came to and end. 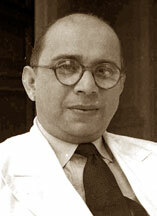 Although only Cecil de Silva from the CP was elected to the VC, the progressive group decided to make him the Chairman as he was a veteran politician and trade union leader. At this juncture the UNP tactfully offered the post of Chairman to K. A. Lanckachandra who won Devamottawa ward from the progressive camp but he declined to betray his side. So Cecil de Silva was elected the Chairman. The Andiambalama V.C. witnessed a steady progress under the Leftist rule. Before Sinhala became the official language, the Andiambalama V. C. worked in Sinhala and issued all its licences and documents in the national language. It increased the tax for numerous mills in the area and used the money to develop the place. It prohibited killing buffaloes for meat to meet their scarcity.When the SLFP was inaugurated in September 1951, it got considerable support from Catholic Negombo. C. M. Fernando, Mudliyar W. M. Munasinghe, Preman de Silva and H. D. David were among its founder members. 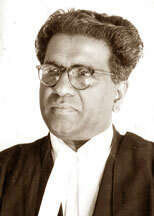 C. M. Fernando, the lawyer was a former Chairman of the Negombo UC and Preman de Silva was an up and coming lawyer. 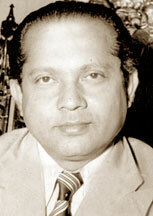 Mudliyar W. M. Munasinghe was a bus magnate and a prominent personality in Negombo. H. D. David was a mill owner and Catholic philanthropist from Katana who was the treasurer of the SLFP from its inception till the 1980s. At the inaugural meeting of the SLFP, apart from himself and H. Sri Nissanka MP, S. W. R. D. Bandaranaike selected S. Selvaraja to address the gathering on behalf of Tamils, Badi-ud-Din Mahamud on behalf of Muslims and C. M. Fernando on behalf of Catholics. So C. M. Fernando was a front-line leader of the SLFP.For the general elections in 1952, there was an idea among the Leftists that it was better for Dr. Hector Fernando of the LSSP to contest Negombo than Santiago Fernando from the CP-VLSSP United Front. This was because the Catholics did not abhor the LSSP to the extent they detested Communists.At this time Santiago Fernando was teaching in a far away school in Waga. Although he came to Negombo for weekends, he was not in a position to organise the whole electorate. Both the VLSSPers Edwin Fernando and Henry Karunaratne for some reason or other insisted that Dr. Hector Fernando should contest Negombo. So it was decided at talks to avoid clashes among Leftists that Dr. Hector Fernando should contest Negombo.At the 1952 elections A. N. D. A. Abhayasinghe the Mayor, Negombo was the UNP nominee from Negombo. Dr. Hector Fernando was the LSSP candidate and C. M. Fernando contested from the SLFP. M. Bernard Kurera and M. C. B. Senanayake entered the fray as independents. However it was evident that the main contest was between A. N. D. A. Abeysinghe of the UNP and Dr. Hector Fernando of the LSSP.Although A. N. D. A. Abhayasinghe was a Buddhist leader the Catholic Church backed him because he was the UNP candidate. All the Catholic institutions and organisations were directed to ensure his victory. The Catholic priests in their sermons at Holy Mass warned Catholics not to vote for Marxists. They also cautioned them not to split the Catholic vote. The SLFP candidate C. M. Fernando was a devout Catholic and he was married to a family who were great benefactors of the Church. When he met the Archbishop of Colombo, after inaugurating the SLFP, the Archbishop had given him his blessings for organising a party as a democratic alternative to UNP. So C. M. Fernando welcomed some Catholic support as the SLFP candidate.However the Catholic priests openly supported the UNP. They did not like C. M. Fernando veering Catholic voters and some of them instructed Catholics not to vote for him. In fact at the premises of St. Anthony’s Church, Katana built and donated by Mrs. C. M. Fernando’s parents, he was present at the election day in support of her husband. The priest there canvassed for the UNP in her very presence.At the end, A. N. D. A. Abhayasinghe, the UNP candidate polled 22,771 votes and Dr. Hector Fernando of the LSSP polled only 9,396 votes. Thereby A. N. D. A. Abhayasinghe defeated his nearest rival by over 13,000 votes! Bernard Kurera polled 3,301 votes and came third C. M. Fernando of the SLFP polled only 3,207 votees and even lost his deposit. So was M. C. D. Senanayake who polled only 551 votes. In the Catholic seat Ja-ela adjacent to Negombo, Mudliyar D. P. Jayasuriya of the UNP polled 18,212 votes and defeated the LSSP candidate L. W. Panditha from the LSSP who got 6,308 votes by over 11,000 votes. The SLFP candidate S. S. Anthony polled 5,790 votes. It is said that the LSSP candidate got a few hundred votes above the SLFP nominee, because of working class votes at Ja-ela.As a whole it was found that because of the strictures of the Church, the Catholics were moving away from the Leftist parties. Although at the 1947 election, Santiago Fernando of the LSSP lost Negombo by only 956 votes in 1952 Dr. Hector Fernando, the LSSP candidate lost by over 13,000 votes.It was evident from the 1952 election, the SLFP was gaining ground in Catholic areas as an alternative to the UNP. In Chilaw at 1952, the SLFP nominee J. C. W. Munasinghe lost to the UNP candidate Shirley Corea by just 54 votes. Hugh Fernando, who later became a leading figure in the SLFP contested Nattandiya against the Speaker Albert F. Peiris as an independent and lost only by 306 votes. Although Dr. Hector Fernando lost Negombo by a thumping majority, he did not lie low. He filed an election petition alleging all the grounds that could vitiate an election. A. N. D. A. Abhayasinghe retained all the leading election petition lawyers for the case. Dr. Hector Fernando retained Dr. Colvin R. de Silva.At the inquiry Dr. Colvin R. de Silva withdrew all the charges except one and led evidence only on the count that the Catholic priests exerted undue influence on voters when they asked Catholics from pulpits not to vote for Marxists. The election petition was of course dismissed and the order for costs amounted to only Rs. 1,000 odd. A. N. D. A. Abhayasinghe had to spend for both the election and the election petition. He later gave up politics and did not contest the seat in 1956 general election. 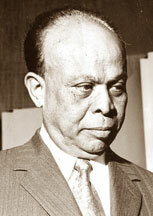 A. N. D. A. Abhyasinghe devoted the rest of his life for the Co-operative movement and Buddhist activities. After the 1952 election there were many clashes between the Catholic Church and the Leftists in Negombo. At Katana when a Samasamajist died he was not given the Catholic burial ground. His relatives placed the coffin in the church premises and they were compelled to accommodate the corpse in the church cemetery. K. Julian Perera of Periyamulla, a strong VLSSPer was asked to perform a public act of penance for openly supporting a Marxist Dr. Hector Fernando at the election if he were to have a Catholic wedding in a church. Julian Perera refused, became a Mathodist and got married from a Methodist family. An English bard who lived in the medieval ages had said “My head is bloody but unbowed”, describing the strength of will and character of a man who refused to change his convictions despite the beatings and forture he had to undergo. Dr. Hector Fernando was a person of such calibre. Although he lost the Negombo seat at the 1952 election with an overwhelming majority, he was not disheartened. Dr. Hector Fernando carried out his political activities in Negombo even with more enthusiasm, courage and determination.